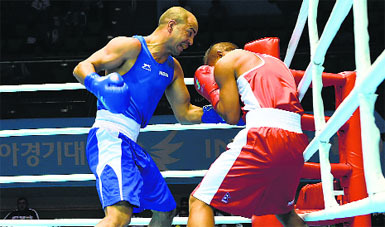 Akhil Kumar, the original boxing star, 33-going-on-34, today fought his first international bout in four years. Akhil isn’t the one to be coy or diffident when he gets into a fight, but today he had reason to be fearful and cautious in the round-of-32 bout. The 60kg boxer had been unwell, down with viral fever and on medication, and feared if he’d be able to step up and take a pounding on his body. 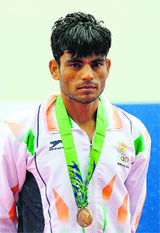 After winning a bronze today, rower Dushyant Singh Chauhan was disconsolate and upset. Chauhan didn’t want to deal in anything less than gold — that was his declared aim for the Asian Games. The Armyman didn’t get what he wanted, but he brought cheerful news to the Indian camp with the day’s only medal, in the lightweight men's single sculls, a 2,000 metre race. 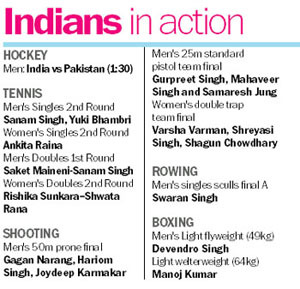 It was barely a couple of days before the Asian Games were to begin that the Indian pugilists were allowed to participate under the Indian flag. This happened only after the international boxing association (AIBA) provisionally recognised Boxing India to administer the sport in the country. Three days ago, when Arpinder Singh, India’s best triple-jumper, landed in Incheon, he was without an unwanted companion — doubt. That was so because he had with him SS Pannu, his coach, whose advice is critical to his chances at the Asian Games. The revised Draft National Sports Development Bill, aimed at bringing more accountability and transparency in the functioning of National Sports Federations (NSFs), will be introduced in the winter session of the Parliament. An unstoppable Kolkata Knight Riders stretched their winning streak to a record 12 games after the reigning IPL champions edged past Perth Scorchers by three wickets to all but confirm their semi-final spot in the Champions League Twenty20, here today. India fought valiantly before conceding a late goal to lose 1-2 against three-time defending champions China in the women's hockey competition on Wednesday. 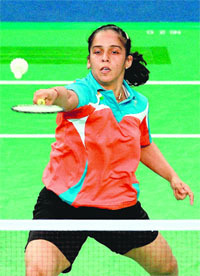 Barring the late blunder, the Indian eves matched their fancied rivals throughout to raise hopes of an upset. But it was not to be as the world No. 5 team scored a late winner through Yudiao Zhao. China enjoyed the early share of exchanges but India started to get their footing in the match towards the end of the first quarter. Jaspreet Kaur scored the lone goal for India by converting a penalty stroke. There were bigger demons — four years on, his body is older, younger boxers have emerged, the scoring system has changed. 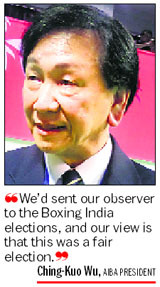 There have been no preparatory tournaments because of the suspension of the Indian boxing federation. Akhil Kumar was not fighting only Purna Bahadur Lama tonight — he was fighting the passage of time, doubt, the fear of pain. His opponent tonight, Lama of Nepal, seemed to be in the thrall of even bigger fears; Lama has a rather peculiar problem — he’s extremely reluctant in throwing punches. For a boxer, that’s a killer problem. Seeing him box, it seemed likely that he is an accidental boxer — did a Nepalese boxing coach simply spot a sturdy lad and forced the boxing gloves into his hands? But Lama, 32 and a police officer, has been boxing for 16 years. It was he who landed the first punch of the night. Akhil, though, went on to give Lama a severe pounding, landing several multi-punch combinations, forcing the Nepalese to take two standing counts in the first round and one in the second. Lama’s response was to protect his face and duck low — even when Akhil put his own guard down and planted himself a foot away, Lama didn’t oblige — every 15 seconds, he attempted a high hook. He rarely connected, and the referee, mercifully, stopped the ‘fight’ in the third round to give Akhil a technical knockout. Akhil played his part well; he moved fast, ducked and weaved and moved out to avoid the punches that rarely came; Akhil’s was a solo performance and, despite the non-cooperation of Lama, it was quite impressive. Before joining the Army, Chauhan, 22 next month, used to dabble in kabaddi and wrestling. When he joined the Army, a rowing coach suggested that his physique and strength would make him a good rower — he’s a six-footer and has brawn in the arms. In just over a year, Chauhan won a silver medal in the quadruple sculls event at the 2013 World Championships. The Jhajjar lad didn’t find happiness today, but he did well — he led from the 500m mark for about 1,300m, up to the 1,800m mark. At that stage, Hong Kong’s Kwan Hoi Lok and South Korea’s Hakbeom Lee got past him. At 1,500m, Chauhan’s time was 5 minutes 27.55 seconds; Lok was a second behind, and Lee a further second adrift. at the advice of national coach Ismail Baig, he reduced his weight from 78 to 72 and moved to the lightweight sculls event. “I thought I had better chances in this event,” said Chauhan. There have been allegations that the AIBA had favoured BI — one Indian official had gone to the extent of alleging that bribes had been used by the BI officials to buy AIBA’s approval. “No, it doesn’t work that way… Everything we did was under our rules,” Wu said. Significantly, Wu said that the national bodies of different sports are governed by the international federation, not by the National Olympic Committee of that country. 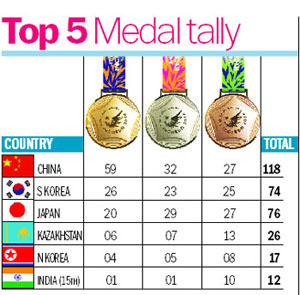 Arpinder Singh missed out on gold at CWG. But with his coach, SS Pannu (right), by his side this time, India’s best triple-jumper has his mind set on a gold. Doubt and fear have been Arpinder’s companions in the recent times. At the Glasgow Commonwealth Games, Arpinder won a bronze with a jump of 16.63 metre. The Amritsar lad jumped to 16.63m on the first of his six attempts — he seemed set to go for gold. But he never went past 16.63, fouling his last two jumps. Arpinder got a medal, but he was not delighted – it was cold and wet in Glasgow, he had problems in his run-up, and he had no one to turn to. Pannu was not with him, for he hadn’t been included in the Indian contingent for the CWG. Arpinder’s event is complex in its technicalities. He launches his attempts with a sprint some 47 metres away, and gains speed as he nears the take-off mark; then it’s over in an instant — hop, skip and jump. During the sprint, the last thing he wants on his mind is doubt — doubt kills success in sport. During the National Inter-State Athletics Championships at Lucknow in June, Pannu noticed that the run-up was a bit shorter than 45m — so he extended it with wooden planks and cotton sheets. Arpinder promptly set a national record, 17.17m. He couldn’t have done it without Pannu. Arpinder beat Renjith Maheshwary, the previous national record-holder, by a stunning margin of 63 centimetres. After the Glasgow hiatus, Pannu is with him here, and the two are confident that they’d be going for nothing less than the gold. Overall, he’s glad with the way his season has gone. 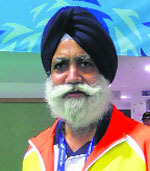 Arpinder said he’d been working on the different aspects of his technique — runway, half-strides and launch. He has a few more days to work before the event — the qualifying sessions for triple jump are on October 1, and the final the next day. “I’ve not been executing the full jumps in practice, I’d be doing that only in competition now,” Arpinder said. "The Bill is ready and has been circulated to all stake holders. After the change in the government, fresh comments have been sought. The IOA has been dragging its feet, but we will present the Bill in the next session of the Parliament," said Secretary Sports Ajit Sharan. Sharan said the Bill will be placed before the Cabinet next month after getting the IOA's response on some contentious clauses. The IOA, however, informed another official, is in disagreement with the Ministry over age, tenure, and the term of the office-bearers. "We have to respect the autonomy of the NSFs and the Olympic Charter, but, at the same time, they are subject to the RTI. They have been advised to put up information on their expenditure, criteria for selection of athletes, money spent on office bearers on their websites," said Sharan. Asked about the Ministry's failure to bring the BCCI under the RTI Act, Sharan said, "The High Court in Chennai stayed it and we could not get the stay vacated. This is our failure. We have made fair amount of effort to bring the BCCI within the ambit of RTI." Sharan said the IOA-appointed ad-hoc committee, which was entrusted with the task of running the affairs of boxing in the wake of IABF's suspension, has been dissolved and the Ministry is considering Boxing India's application for recognition as NSF. On the resumption of bilateral cricket ties with Pakistan, Sharan said the Sports Minsitry would welcome any such development. "This is a diplomatic issue which concerns the MEA. If the cricket ties resume, we will welcome it but we are not making any special efforts in this regard," he said. Chasing 152 for win, KKR lost early wickets but Suryakumar Yadav (43 not out) and Yusuf Pathan (21) stitched a 38-run sixth-wicket partnership to help them achieve the target in 19.4 overs and set a domestic record of 12 straight wins. Earlier electing to bat, Scorchers rode Adam Voges' unbeaten 71 to post 151 for seven in 20 overs. Joshna Chinappa and Anaka Alankamony made a great comeback as India defeated higher seeded Hong Kong 2-1 to brighten their chances of another medal, in women's team squash. In the men's section, India defeated China 3-0 . This is their second win, having beaten Jordan 2-1 on Tuesday. Having lost to Hong Kong 0-3 in the Asian Senior Women's Championship, this was a grand turnaround for India, who had beaten Pakistan 3-0 in their previous match. Archer Dipika Kumari kept alive India's medal hopes in archery as she booked a place in the pre-quarterfinals of the individual recurve event. The 20-year-old, who won two gold medals in the 2010 Commonwealth Games, shot a total of 1337 over four distances 70m, 60m, 50m and 30m. She faces Uzbekistan's Munira Nurmanova in the pre-quartersfinal elimination round on Friday. Laxmirani Majhi also made it to the pre-quarters after she finished 15th with a score of 1319 and will be up against Sharbekova Asel of Kyrgystan in the elimination round. Antigua: Still recovering from a hamstring injury, Chris Gayle was on Wednesday left out of the West Indies’ 15-member squad for the One-day series against India scheduled next month. The 35-year-old Gayle was the most notable omission from the squad to be led by Dwayne Bravo in the five-match series starting October 8 in Kochi. Squad: Dwayne Bravo (capt), Darren Bravo, Jason Holder, Leon Johnson, Sunil Narine, Kieron Pollard, Denesh Ramdin (wk), Ravi Rampaul, Kemar Roach, Andre Russell, Darren Sammy, Marlon Samuels, Lendl Simmons, Dwayne Smith, Jerome Taylor.